Stay comfortable, casual and cruelty-free wearing vegan sandals from our Amazon-curated collection. Whether for yourself or a discerning woman in your life, you can buy any of these sandals with the assurance that they're free of animal-derived materials and by-products. What are “vegan” women’s sandals? Vegan women’s sandals are simply sandals that only use materials (including dyes and adhesives) that are not derived from, or tested on animals, and as a result are considered vegan and cruelty-free. 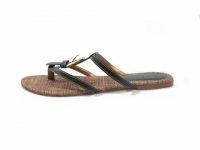 Women's vegan sandals can come in a variety of colours and styles, and can be made from different natural and synthetic materials. 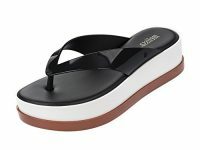 What materials are used to make vegan women’s sandals? 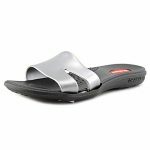 What styles for women’s sandals are there? All styles and colours of women’s sandals can be made without the use of animal materials, by-products and testing. They can pull off the same, look, feel and function as their animal material-based counterparts. Why harm something that you don’t have to? Yes, and it’s a simple yet effective form of animal activism! Here’s how it works; by purchasing vegan sandals (or any other ‘vegan’ product, for that matter), you’re telling manufacturers and designers that there’s a market for these animal-friendly products. Revenue coming in from these products will help support the product line, so more of them can be made. Demand fuels supply. This also works two ways; the more vegan sandals leaving shelves, the more leather sandals that sit on shelves and collect dust. This means that ultimately, the leather sandals won't get re-ordered by retailers. This sends the message to companies that the market for cruelty-derived products is shrinking; lack of demand fuels lack of supply. Are women’s vegan sandals expensive? Similar to their non-vegan counterparts, the cost to make vegan and cruelty-free women’s sandals can vary quite a bit from one company and one pair to the next, due to differences in materials used and production methods that are in place. As a result, their retail prices will vary quite a bit; some pairs are quite affordable, whereas others would be considered luxury items; most fall somewhere in between these two ends of the spectrum. This is a controversial topic within the vegan community. In our opinion, it’s up to you to decide what you should do with your old sandals, and other non-vegan items. If you can’t even look at your leather closed-back thongs after you turn vegan, then give them away or sell them. Alternatively, if you want to keep wearing them until they've outlived their usefulness due to the expense or inconvenience of replacing them, simply replace them with a vegan pair of thongs when the time is right. Whatever you do, try to avoid just throwing your old pairs away. 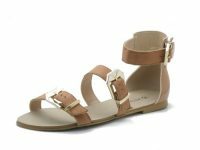 What companies make vegan sandals for women? We keep a list of ladies footwear companies that we find via social media, word of mouth, by old-fashioned Google searches and by other methods, whose entire catalogue of sandals seems to be vegan. We contact these companies to check that they don’t use any animal-derived materials or testing in the making of these products. If we’re convinced the items are suitable for vegans, and they’re listed on Amazon for your shopping convenience, then we display them here for your shopping convenience! Short answer, yes, long answer, it depends on the company. If we have a hard time getting straight and consistent answers from non-vegan companies with regard to which of their products are suitable for vegans, we won’t list their products. We just need to be 100% sure that the products we list for you here are cruelty-free and vegan-friendly. In the face of uncertainty, we won’t list a company’s products. If you’ve found this page helpful, check out similar product categories to learn or shop more! If you or your employer makes vegan flip flops, thongs, dress sandals, sliders, strapped sandals, clogs, or any vegan product for that matter, we’d love to feature those products on our site... for free! Contact us at - info(at)getitvegan(dot)com - to find out more!